In Dino Dude Ranch each player attempts to capture Triceratops, Stegosaurus, and the dreaded Tyrannosaurus Rex by luring them from the Jurassic Hunting Grounds with their favorite foods and bringing them back to their own Dino ranch. Your and your Hired Hands will need to act fast to fill your ranch with dinosaurs before the tar pits cover your land. Dino Dude Ranch has an expansion now. 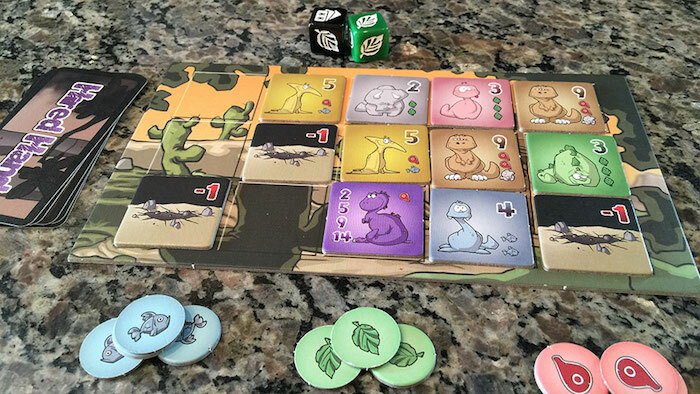 Check out our review of Dino Dude Ranch: Hatchlings. Setup for Dino Dude Ranch is straightforward and fast. The Jurassic Hunting Grounds board is set in the middle of the table and populated with 4 dinos, drawn at random from the bag. 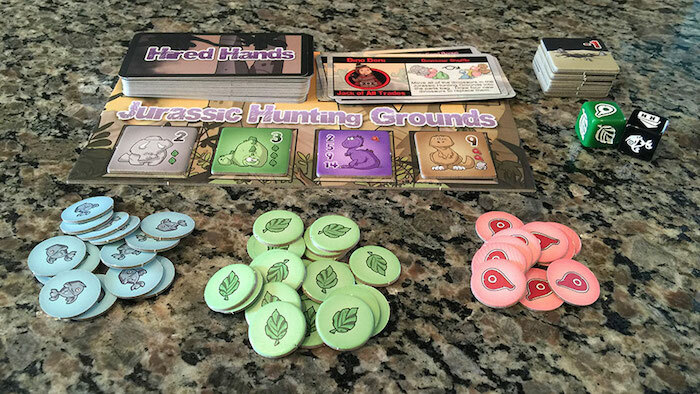 The food tokens (leaf, fish, meat) are placed within reach of all players the Hired Hand cards are placed in their space on the Hunting Grounds, and the tar pits tiles are stacked nearby. Each player takes a double-sided ranch board (the “day” side with 15 spaces is for 2-4 player games, while the “night” side is for 5 player games), a single Hired Hand card from the deck, and a Rancher Bonus card (which also doubles as a reference card). Keep the bonus card hidden from the other players. Finally a start player is chosen, and you’re ready to play the game. A players turn is comprised of 1 to 4 actions. Players will always roll the dice and collect the corresponding resources. Players may also roll a Hired Hand (take the top card from the stack), or a tar pit (add a tar pit to your ranch). Players may then capture up to 2 dinosaurs (providing they have the resources), purchase up to 2 Hired Hand cards (2 resource of any type per card), or play a single card. Play proceeds in this manner until one player has filled up their ranch, OR all dinosaurs have been captured (both the Hunting Grounds and the bag are empty). Players add up the total of all dinosaurs, including points from the sets found on their hidden bonus cards, then substract their tar pit cards. The player with the most points at the end of the game is the winner. The Hired Hand cards fall into several broad categories: cards which give you resources, cards which allow you to take extra dinos from the Hunting Grounds or steal them from your opponents, and cards which give you straight points. Most cards must be played on your turn, but some cards allow you to play them during any player’s turn. These generally allow you to prevent another player from doing an action, or to affect another player’s action. The cards definitely turn Dino Dude Ranch from what could be a fairly bland game into one with some strategy and planning. At any point another player could steal a dino from your set for themselves, or force you to reroll the die with that resource you’ve been needing. Clever use of the Hired Hand cards will definitely affect the course of the game. The Dino Dude Ranch box is a tank. It’s so heavy duty that I joked with the designer on Twitter that I could stand on it. The art and illustrations are fun and colorful without being gaudy or too vivid. The dino and tar pit tiles are thick and well printed and the bag which holds them is quite well made. Stretchy and very easy to get your hands into to draw out tiles. In fact for any games which use bags for pieces, I’d LOVE for them to use this exact same type of bag. The Hired Hand cards have a nice linen finish and easy to read. The food tokens are nice cardboard discs about the size of a nickel, with clear color and iconography. 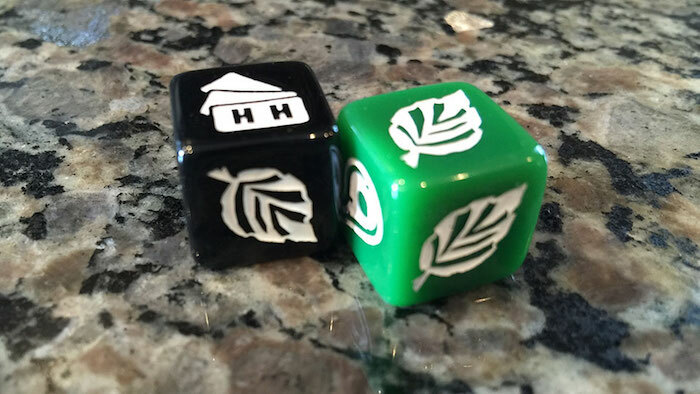 The dice are excellent with deep recesses for the icons, and a good heft in the hand. The gameplay is easy to teach and quite fun. On any turn you never know just what you might roll. Will it be that one resource you need? A Hired Hand card to help you out? Or will it be a tar pit which takes up valuable space in your land? The cost to lure the dinos to your ranch is low enough that it generally will only take a turn or two to collect the necessary resources, and turns take such a short amount of time that even my 5 year old didn’t lose patience or get bored. 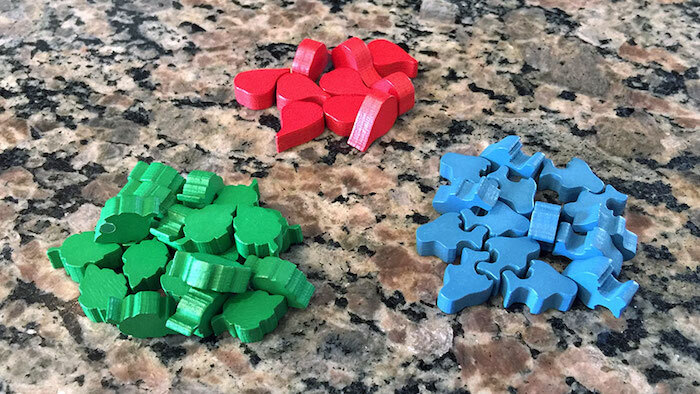 If you backed the Kickstarter at the Deluxe level, then you were upgraded to wooden bits in place of cardboard. I backed at the base level, but opted to purchase the deluxe kit which added Velociraptor tiles and nice wooden bits. There’s only a few things which bother me about Dino Dude Ranch, and most of them are purely cosmetic. The art, while well drawn, isn’t my personal style. Also, some of the graphic design could have been tightened up a little, and improved overall. The Hired Hand cards are the same height as poker cards, but only about half the width. This makes them hard to shuffle and to deal. The text on the Hired Hands cards is easy to read, but they could have benefitted from some pruning. Any time you can remove text from something and still keep it’s understandability it’s a win for everyone. My kids really enjoy playing this game, and so do I. My 10yo daughter even invited her friend over to play a game. I could see the wheels turning in my daughter’s head on how she could use Hired Hand cards to prevent her friend from doing various things. My 5yo son really enjoys this game and loves buying dinos, putting them in his ranch and drawing new tiles from the bag. I was pleasantly surprised after playing this game. I expected something that my kids would like, but that I’d merely tolerate. Letimann Games did a great job of delivering a game that truly is fun for the family. 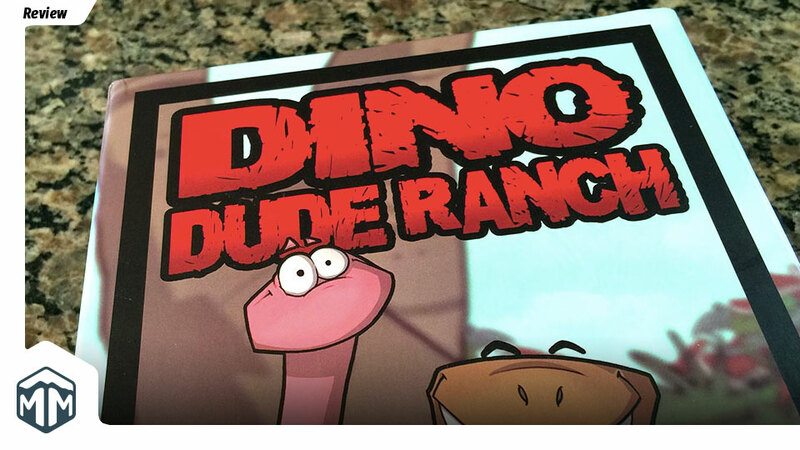 If you get a chance to pick up Dino Dude Ranch you shouldn’t pass it up.